Maps may not be modified once they have been submitted. Screenshots will be taken of each map to ensure that the original version is what is rated. Please remember to check your work before entering your maps!! Maps can be entered into the contest one of two ways: You can post a link to your map right here on the forum thread or you can send me a PM declaring that you'd like to enter it into the contest (please provide a link to the map). Entries will be accepted through the end of January. Each map submitted will be reviewed by Map Committee members who will provide a 0-5 rating in each of 3 different categories, described below. The average of these ratings, along with a brief summary, will be provided in the form of a comment on each map. Some scores may be provided before the contest is over, but a winner will not be decided until the deadline is up and all entries have been evaluated. Playability: First and foremost, it's important to design a map that can be playable and fun. This category is devoted to ensuring that the map will not stalemate, has a good terrain balance, a comfortable and appropriate production facility and funding level, interesting front dynamics, etc. In short, would gameplay be smooth, natural, and rich? Balance: The biggest problem with asymmetrical maps is the fact that they are nearly impossible to balance perfectly. Therefore, it's only fair to rate an asymmetrical map based on how well that challenge is overcome. Basically if two equals played an equivalently good game, would one side favored over the other? This can get complicated fast, but we will be looking at this in excruciating detail if it comes down to it. Creativity/Aesthetics: Who says you can't get style points? Asymmetry opens the door to a lot opportunities that just aren't possible in symmetrical maps, so take advantage of them and make something creative, innovative, and easy on the eyes. Impress the judges! These rating systems are designed to be an absolute scale such that 0s and 5s are actually indicative of the worst and best you could expect to see on the site. Asymmetrical maps are hard to design so this will also help give some perspective as to how some great designs would compare to balanced and respected symmetrical maps. For that reason, those who are truly deserving of 5s stand out- if you receive a 5 in any category, you should be extremely proud of yourself! Now that you have all of the information, allow me to give an example score for this map that I created to kick off the tournament. This will help give you an idea of what things we will look for in a map and what kind of feedback we'll give. 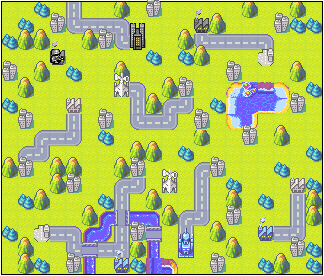 Map Design/Playability: 4 Overall nicely playable, but has some shortcomings, including low funding for the number of bases/airports, lockable airports, and mediocre city distribution. Balance: 3 Generally equivalent funding, but property locations, while similar, are somewhat imbalanced in terms of both distance to/from key points and defensive capabilities. More attention to balancing neutral bases and city location/capture phase progression could make this a 4. Creativity/Aesthetics: 3 Decent looking map with notable asymmetry earns the map a solid 3. However, it does not go above and beyond to earn points for creativity or for using asymmetry to be innovative. Apart from the asymmetry, this map sticks to a standard mold. Alright, now that you have an idea of what to expect, get out there and start making some maps! If you have any questions, please send me a PM or post here on this thread and I will answer them as soon as I can. Good luck! I love the idea. I'm in! I'm posting this as a reply instead of editing my post, because some of the formatting tags don't show up properly (probably because of my intentional misuse of the "list" function) and it would take a lot of effort to reformat everything when I edit. Moral of the story is that I want to slightly modify the rating system a bit for the 4 and 5 ratings for the Playability and Balance categories. 4 should be "best Casual Play or low A-rank equivalent" and 5 should be "high A-rank or S-rank equivalent". The goal here is to make 4s and 5s a bit more attainable, but a 5 would still be indicative of something that could be used in a competitive play environment, such as GL, without any concerns (at least in the category where it gets a 5). This doesn't make much of a difference for people submitting maps, but it might slightly change the ratings we'll give across the board. It's still midnight in the continental United States! Thanks for the submittals! Mostly as a result of all of the site events, I'm leaving the deadline open-ended for now, potentially through the end of the month. We'll try focusing on getting results back for the maps that have been submitted so far and see what the interest level is looking like at that time. If people are still submitting maps, we'll be more inclined to leave the deadline open, but otherwise we might close it sooner rather than later. Since it's currently open-ended, here comes my work. I don't know whether the background can be loaded sucessfully. It fails in my computer now as there is something wrong in the site. Here comes my second work which is more asymmetric than the 1st one. Obviously making a fair map with Max and Grit as the CO's is near impossible, but I think I did manage to make a map that plays to both their strengths, is asymmetrical, and is still balanced. It may as well be. I never got around to scoring most of the maps, so maybe one day I'll get around to it. If people want to keep posting maps, I don't see any reason not to include them. That said, your map hurts my head.